Popular manga “One Piece” will become a live-action TV drama through a collaboration with a Hollywood production team, according to the firm that publishes the series. 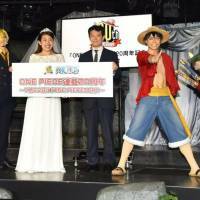 Adelstein said in a written statement Friday that he has been a fan of “One Piece” for 20 years and is honored that Shueisha Inc., which runs the manga in its weekly Shonen Jump, and Eiichiro Oda, the author of “One Piece,” entrusted his studio to create the live-action drama. He added that the production costs for may set a new record for a TV drama series. Details of the project, which will be run by Shueisha, Oda and Tomorrow Studios, are yet to be confirmed, including how much the production will cost, the broadcaster that will air the show, and when it will be broadcast. The announcement came as one of the most popular manga titles in Japan marks the 20th anniversary on Saturday since it debuted in the Shonen Jump magazine. “There have been offers from various directions about live-action before but they did not really get settled for a number of reasons,” said Hiroyuki Nakano, editor in chief of Shonen Jump magazine, at a news conference in Tokyo. “This time, it’s finally come to the point where we can make an announcement. This means that we consider the project this time to have exceeded our expectations,… so please look forward to it,” he said. The offer was made about three years ago, according to Oda. Over 350 million copies of his comics have been published in Japan, and 66 million overseas.